This section of our website is a growing resource for the those who wish to explore the history of the church and its graveyards and memorials. In the 1970's Camden History Society (CHS) undertook a complete survey of the graves and monuments. This resulted is a list of about 7000 names. A description of each grave / memorial was also recorded and these paper documents have been digitised and are available from our search page. The originals are in the Camden Local Studies and Archives Centre (Information). Further weathering has taken place since the record was made. The Churchyards are now Sites of Special Nature Conservancy Interest so they are protected. If you are researching a particular person or are a family historian trying to find your ancestors please start with our search page. You will be presented with a clickable link from the grave / memorial number which will in turn bring up a list of all the people mentioned and any more information that we might have added. There is a link (s) to the CHS record. The Additional Burial Ground opened in 1812. As part of the celebration in 2012 a website was set up to highlight some of the people buried there. 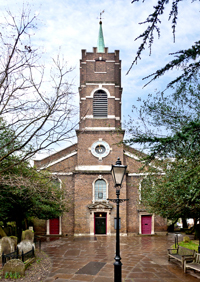 Christopher Wade of the Camden History Society has produced a book, Buried in Hampstead, which can be obtained from the church or from our online shop price £7.50, plus postage and packing. This is an interesting guide to notable people buried here and to graves of particular interest. Tomb Trails are also available at the church as a guide to some of the most interesting graves. We are indebted to Mrs Pat Gardner for her patience in typing up the original list and enabling it to be put into a database. Whilst every care has been taken with this information we are unable to guarantee that it is in all respects accurate.